OVER 400 PEOPLE HAVE SEEN THIS PAGE SINCE 34C3 AND THERE ARE MORE EVERY DAY; AWESOME! I AIM TO HAVE MORE DIAGRAMS AND MORE CLEAR BUILDING INSTRUCTIONS READY BEFORE THE SECOND WEEK OF JANUARY; INCLUDING NICE REFERENCE CARDS AND PICTURES TO CLARIFY THINGS. FOR NOW, NOTE THAT THE GENERAL BUILD-INSTRUCTIONS ARE CORRECT. 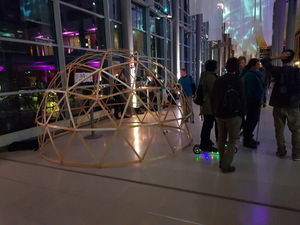 I HAVE TALKED TO A NUMBER OF PEOPLE AT 34C3 WHO WERE SERIOUS IN BUILDING A DOME LIKE THIS. 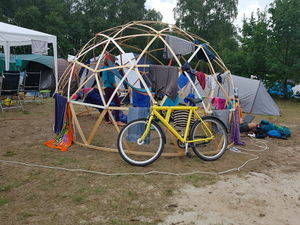 I WOULD LOVE TO GET INTO CONTACT AND ENSURE THAT WE'LL HAVE A MINI-DOME ASSEMBLY/WORKSHOP AT THE NEXT CONFERENCE; HOPEFULLY WITH TUNNEL-LIKE CONNECTIONS JOINING THEM TOGETHER, HAMMOCKS, ETC. Domes are very interesting and fun structures to work with and look at. They are unexpectedly strong and versatile. There is a lot of info about constructing domes from all manners of material, mostly concerning wood or metal pipes; and a lot of them require special or hard-to-get connection systems that make construction easy or just simply 'strong' for permanent use. However, sometimes, you just want to own a dome that you can store in a sports-bag and put up and/or take apart in less than an hour and costs around 40 euro of parts. If you are this kind of person: this project is for you. The idea behind this project is to use easily acquired trash-material as a basis for a dome. It turns out that finding thrown-away wooden 'slatted bed bases' is quite easy. A lot of people throw them out into the trash the moment one of the slats break. A nice aspect about this base-material is that is often comes in semi-standard sizes. Finding enough material of 80CM slats turns out to be quite do-able. Made out of 165 pieces of wood, joined at 61 places by steel bolts + wingnuts. The dome does not need to come apart entirely into seperate pieces of wood. Instead you can have it be kept and transported in around 30 bundles of wood that make assembly an easy thing to do. A lot of bed bases are around 80 CM wide; this means that it is smart to standardize on this size as the largest length we use. To make the process of creating all these lengths efficiently, it is best to make three cutting-jigs of the right lengths that you can either use to mark the wood with, efficiently, or use directly on a table-saw or chop-saw. This makes very light work of the process. To drill the holes, mark a hole 2cm from from the end, on each end. It makes sense to use a marking jig to make this easy instead of having to use a ruler to do so each time. Use a block of wood, underneath your slat, to drill into so that you get nice clean holes. Most of the work is in cleaning up the drilled holes, preferably with a reaming bit from both sides. This means 4 operations per slat (you can see that this takes the most work). You will have 60 joints to make. You will need 60 bolts, 60 rings and 60 wingnuts. The holes should be a useful diameter; I used 6mm 'lockbolts' which have a lovely semi-spherical topside and a square profile just underneath which 'digs' into the wood and makes sure it stays nicely in place. The length of the bolt should be enough to connect 6 layers of wood together + a little more for the wing-nut to fasten onto. 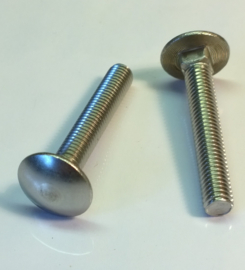 If you use 1CM thick wooden slats, you will require a 7CM lockbolt to connect it. The wingnuts should fit your lockbolts. The rings should be nice and large to spread the force of the bolt and wingnut across the wood. 35mm rings seem to work well for this. It never hurts to have some spare as you might lose them in buildup or takedown somewhere in high grass. Of course, nobody wants to have to know how to keep track of 165 pieces of wood and know how to connect them to get a dome. Luckily, there's options to make that a simple process. There is one pentagon exacly at the top of the dome. 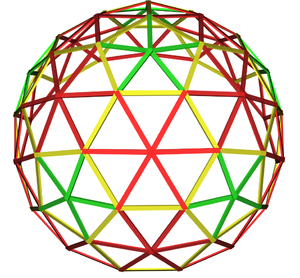 The five corners of this pentagon point to the top-corners of the 5 other pentagons that are around the circumference of the dome. These 5 pentagons are connected to each other to form a circle. The first time you put the dome up, it will likely take up quite some time before you get the hang of things. It can be done by 1 person in about 2 hours or so. Relax, go step by step and make sure to understand the shape of the dome, it's regularity and the bet way, for you, to put it together. First take the 30 Type C lengths (green) and make sets of 5 of them; connected to each other with a lockbolt. Now, take 5 of the type B lengths (yellow) and connect the other ends together to form a pentagon. These 6 pentagons connect to each other via Length B (yellow) lengths as can be seen in the schematic. Now, take 1 of these pentagons and attach 5 of Type B lengths to each of the corners; sticking out. Now take 60 of the Type A (red) lengths and make 10 stacks of 6. Connect these together with a lockbolt + ring + wingnut. The leftover 20 Type A (red) lengths need to be made into 5 stacks of 4. These fill the area under each of the pentagons around the bottom. The leftover 15 type B (Yellow) length make 5 sections of 3 lengths. The lengths connect together end-to-end making something like a three-segment snake. These will form the yellow frame at the underside of each hexagon along the bottom. The PENTAGON centers are the only connections that will have 'only' 5 connections coming together. Along the bottom edge, there are 4 connections coming together. ALL OTHER CONNECTIONS HAVE 6 EDGES COMING TOGETHER. We will start with the top pentagon. This one is the one with 5 'yellow' lengths sticking out on each of the corners. It is easiest to start by putting it upsidedown on the ground with each of the 5 extra lengths sticking out like the rays of the sun. Now find 5 of the HEXagon sets and lay them on the ground between the rays of the pentagon sun; laying them ready for use. Take one of the hexagon sets and fan it out a little. Take the 'bottom' length of the set and connect it to one corner of the pentagon. Take the NEXT length on this hexagon set and connect it to the OTHER corner. Wait with fastening the wingnut on that corner as you will go around the circumference of the pentagon and repeat this process with each of the HEXagon-sets that you have. This will have each of the pentagon-corners have 6 slats ontop of eachother. Now securely squeeze the stacks of wood together by tightening the wingnut. Don't forget to put a ring in between the wingnut and wood , of course. Good; you now have the top pentagon with 5 hexagon sets attached. Each hexagon set should have 4 unconnected slats and there will be the 5 sunrays sticking out from the pentagon. It is now handy to turn the assembly over, gently, so it's the right way up. The top corner of the new pentagon also gets TWO extra connections on it; one from either of the hexagons on the TOP LEFT and TOP RIGHT of it. The corner with the extra slat also gets a slat from the hexagon right above it. 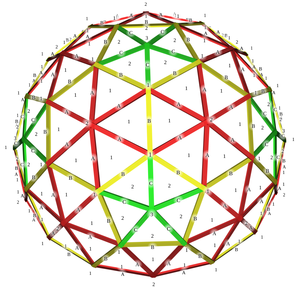 Once this is done, go and add another pentagon; connecting it to the first and assembling it in the similar manner as the first one. Repeat this process 5 times and you will have the dome standing on it's 5 pentagons. You are halfway done. The spaces left over between the pentagons now get filled up again with the other 5 HEXagon stacks. Do this in the similar manner as you did with the top pentagon. You will be able to connect 4 of the 6 lengths to the corners of the pentagons. You can now take the 5 segments of 3 slats and the 5 segments of 4 slats and distribute them around the dome; alternating between them. Lay them on the ground in the right places. The pack of 4 goes underneath each pentagon. The set of 3 goes underneath each of the hexagons. It makes sense to mark each of the 'stacks' of assembled slats with some kind of color or number so you can remember what they are; but really, it's not that hard to remember/recognize what is needed where as long as you have a schematic diagram of the dome's structure accompanied with them. A laminated card will help a lot with this. However, another great way to make it easier for yourself is to use a marker on each of the connections that do not/never come apart so that you know to NEVER dissasemble them. A useful manner is to use a 'X/Y' marking to do this systematically. X is the number of slats that should be connected together at that junction when the dome is dissasembled. Y is the number of slats that should be connected together at that junction when the dome is FULLY assembled. A good example would be to use '5/5' for the center of the pentagons and '6/6' on the center of the hexagons. The bottom sets of 4 slats have '4/4' on them, etc. This page was last edited on 11 February 2018, at 11:32.